DHEA is a natural steroid hormone that is synthesized from cholesterol by the adrenal gland. DHEA acts as an antagonist for glucocorticosteroid hormones and is the precursor for other important steroid hormones such as estradiol, other estrogens, and testosterone. It can also indirectly influence progesterone synthesis via a feedback mechanism in which pregnenolone is converted to progesterone in the presence of high DHEA levels. In addition to its’ role in hormone regulation‚ DHEA may support immune function‚ brain function‚ bone metabolism‚ blood lipid metabolism‚ energy metabolism‚ help regulate normal blood sugar and insulin levels‚ and help maintain a lean body mass. DHEA levels decline with aging, as well as under a variety of physiological stress conditions such as acute and chronic infections, and trauma. Vegetarians also have decreased DHEA levels. Douglas Labs DHEA tablets contain the highest purity DHEA, and are produced under strict Good Manufacturing Practices (GMP). 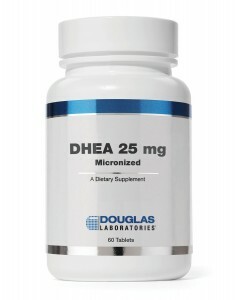 Discover the potential benefits of this high-quality DHEA supplement and order today! All orders placed by 5 PM EST ship the same day. Adults should take half to one tablet daily, only as directed by a healthcare professional. It may be taken by allowing the tablet to dissolve in the mouth and then swallowing, or swallowed with water or juice. Other Ingredients: Mannitol, cellulose, silica, and vegetable stearate. Please consult your physician before using this product. NOT TO BE TAKEN BY INDIVIDUALS UNDER THE AGE OF 18. Do not use this product if you have a family history of breast, uterine, ovarian, or prostate problems or are at risk of or have prostate, breast, uterine, or ovarian cancer. Consult your physician before using this product if you are pregnant, nursing, or taking prescription medications, particularly other hormones or monoamine oxidase inhibitors (MAOIs). This product may cause changes in liver function, alter hormone profiles, increased facial hair, acne, and mood swings. This product may cause virilization in women. Store in a cool, dry place, away from direct light. Do not refrigerate.